An error coin is a coin that was manufactured incorrectly by a mint. Many times called mint errors, error coins come in scores of "shapes, sizes and types." The sheer variety of minted errors adds excitement and uniqueness in collecting them. Before buying a mint error, knowing the type of coin and the latest selling prices for similar coins is a sound idea. The Error Coin Price Guide, generously provided by minterrornews.com, can help by showing recent sales and by providing more information regarding the specific minted error. To use the guide, simply click the error coin image. The appropriate minterrornews.com price guide page will automatically load. This error coin price guide is brought to you by minterrornews.com. It has been compiled by many of the top major mint error dealers. This price guide is a guide. Prices fluctuate due to the date, grade, eye appeal and how dramatic the striking error is. Rarity is also a factor. The price is sometimes based on the rarity and grade of the type of coin as well as how rare the error is. The price can also vary depending on whether two collectors are bidding for the same rare major mint error. When purchasing a mint error, it is important to use multiple resources to determine value, as there are many mint errors that do not fit into one category. 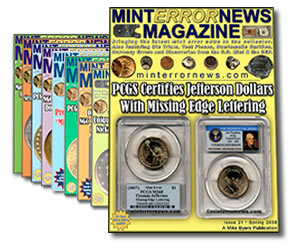 In addition to the above Coin Error Price Guide, minterrornews.com also publishes Mint Error News Magazine. It’s a free, downloadable magazine that comes out every three months. The magazine is published by an expert in the area, Mike Byers. It’s packed with valuable information and spectacular error coin photos. In addition to the magazine’s information on error coins, it includes an error coin price guide by Al Levy of Al’s Coins.